I have a couple of friends and relatives from Manila who are coming over in the next few weeks and they inspired me to write this pocket guide – the do’s and don’ts for tourists in Singapore. Hopefully, they (or any tourist) get to read this before stepping out of the Changi Airport for a more engaging and stress-free exploration in this vibrant Lion City. 1. When referring or paying respect to an older man and woman – call him uncle and call her auntie. 2. When in a fastfood joint or a hawker place, learn to say eating here when you intend to dine in and say take away or ta pau when you want to bring home your food order. 3. Food is delicious and cheap at hawker centres but remember to BYOT. Bring Your Own Tissue as tissues are not free and are usually sold for SGD 1. 4. Tap Water in Singapore is clean and safe for drinking. While water is recycled, the government maintains high water filtration and water recycling standards. Save your money, save Mother Earth. 5. When taking the escalator, stay on the left side to give way to others who are rushing their way up using the right side of the escalator. 6. 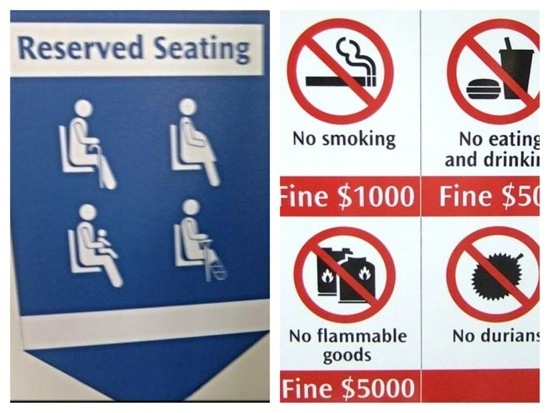 When inside public transport, do not sit on designated seats for the elderly, pregnant, people with disabilities and women with young children. …Even if you see some strong and able locals take those seats, do not follow. Better yet, give up your seat to someone in need and you will receive friendly nods. 7. Squat Toilets. If you are not accustomed to doing your thing in squatting position then be mindful of sit-down and squat signs in public toilets. 8. Tipping is not common in Singapore. Expect your taxi driver to return your exact change. 9. Queue. Singaporeans are disciplined people so queuing up in almost everything and everywhere is a norm. Learn to queue in bus stations, taxi stands, eateries, toilets, etc. 10. Singapore is a Fine City. Even if you do not see police or security officers around, do not litter, smoke in prohibited areas, jaywalk, etc. CCTVs and non-uniformed officials abound in this little city and they strictly enforce their laws. Some More? means do you want or need anything else? So Howwa? means what do we now or how do you like it? Click and share if you find this helpful! Okay lah? !